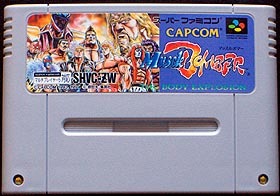 Muscle Bomber is a one-on-one fighting game and conversion of Capcom's arcade game originally released in 1993. 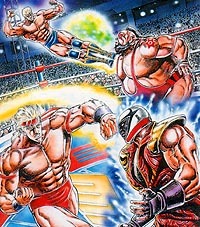 Unlike their other popular franchises (such as Street Fighter), Muscle Bomber features wrestlers. The goal of the game is to become the CWA champion (Capcom Wrestling Association) and to defeat not less than ten opponents. Each fighter has of course his own set of moves, but also his own introduction's dance and music theme. It is also possible to fight outside the ring and use any elements there, like chairs or bottles. Controls are fairly simple - three action buttons are used and allow the player to either hit, jump or spin. However, if the player attacks an opponent in close range, this action will trigger a sort of grapple mode. Special moves are also available for each fighter. Another great originality of this title is to offer team games where four wrestlers can fight at the same time, either two players against the CPU or up to four players against each other. It is interesting to notice that all the artwork and character design for the Muscle Bomber series was done by the famous Japanese artist Tetsuo Hara, creator of Hokutono Ken ( Fist of the North Star ). All the fighters have these typical hyper-muscled bodies and thick necks that made their author famous. It is also amusing to notice that some characters from other Capcom games are also featured in this title such as Haggar from Final Fight. 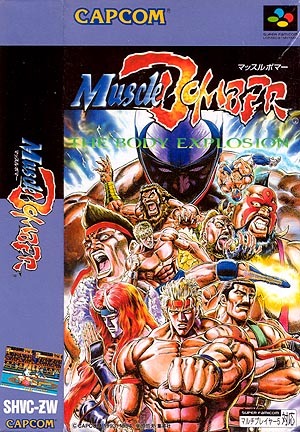 Muscle Bomber was also released for the FM Towns Japanese computer and for Sega's Megadrive (1994). Two sequels were also created by Capcom and only released in the arcades as far as I know : Muscle Bomber Duo : Heat up warriors (1993) and Super Muscle Bomber : The International Blowout (1994). Muscle Bomber is a fun game and is a nice variation of the Street Fighter genre. Graphics are colorful and detailed, all the quality check you would expect from a Capcom game, really. All the different entrances are fun and the overall ambiance quite entertaining. Once again, I wonder why it was renamed Saturday Night Slam Masters in America... anyway. Without being an amazing title, Muscle Bomber manages to mix very interesting features, the four simultaneous player option being certainly one of the best. It has however kind of aged compared to other more recent titles.